The Nuclear Security Summit process and associated U.S. nuclear threat reduction programs have played a vital role in reducing the risk of a nuclear or radiological attack by terrorists. The Nuclear Security Summit process and associated U.S. nuclear threat reduction programs have played a vital role in reducing the risk of a nuclear or radiological attack by terrorists. But the threat is constantly changing and may have grown in recent years in light of the rise of the Islamic State group and indications it may have nuclear and/or radiological ambitions. Despite noteworthy achievements, however, significant work remains to be done to prevent terrorists from detonating a nuclear explosive device or dirty bomb. For example, even after four Nuclear Security Summits there are no comprehensive, legally-binding international standards or rules for the security of all nuclear materials. The existing global nuclear security architecture needs to continue to evolve to become more comprehensive, open, rigorous, sustainable, and involve the further reduction of material stockpiles. It is thus puzzling that just weeks before the final summit in Washington earlier this month, the Obama administration submitted to Congress a budget that proposed significant spending reductions for key National Nuclear Security Administration (NNSA) programs that lessen nuclear security and nonproliferation risks, accelerating a trend in recent years of short-sighted cuts to these programs. If implemented, these decreases will slow progress on key nuclear security initiatives, jeopardize the sustainability of those initiatives, and undermine U.S. leadership in this area. As the Senate and House of Representatives begin their work on the fiscal year 2017 defense authorization and energy and water appropriations bills—which establish spending levels and set policy for Defense Department and NNSA activities—lawmakers should reverse these ill-advised budget cuts. Additionally, Congress should encourage the NNSA to augment its nuclear and radiological security work to help ensure the end of the summit process does not weaken progress toward continuously improving global nuclear and radiological material security. If the risk of nuclear or radiological terrorism isn’t on your mind, it should be. The recent Islamic State group-perpetrated terrorist attacks in Brussels offered another bloody reminder of the danger of terrorism. To make matters worse, reports indicate that two of the suicide bombers who perpetrated the attack had also carried out surveillance of a Belgian official with access to a facility with weapons-grade uranium and radioactive material. A new report published on March 21 by the Harvard Kennedy School’s Belfer Center for Science and International Affairs concludes that the risk of nuclear terrorism may be higher than it was at the time of the third Nuclear Security Summit in 2014 due to the slowing of nuclear security progress and the rise of the Islamic State group. The drop is even steeper when measured against what the NNSA projected it would request for these programs in its fiscal year 2016 submission, which was issued in February 2015. The agency had said it planned to ask for $1.65 billion in fiscal year 2017, or roughly $185 million more than the actual proposal. The largest proposed reduction in the request is to the Global Material Security program, which improves the security of nuclear materials around the world, secures orphaned or disused radiological sources—which could be used to make a dirty bomb—and strengthens nuclear smuggling detection and deterrence. Within this program, the NNSA is seeking $7.6 million less than last year’s appropriation for radiological material security programs and roughly $270 million less for these activities over the next four years than it planned to request over the same period, last year. Most experts agree that the probability of a terrorist exploding a dirty bomb is much higher than that of a nuclear device. This is due in large part to the ubiquitous presence of these materials, which are used for peaceful applications like cancer treatment, in thousands of locations and in almost every country around the world, many of which are poorly protected and vulnerable to theft. A new report published last month by the Nuclear Threat Initiative (NTI) noted that only 14% of International Atomic Energy Agency member states have agreed to secure their highest risk radiological sources by a specific date. Along with reducing the budget for radiological security, the NNSA is planning to transition from a primarily protect-based approach for radiological materials to one that emphasizes permanent threat reduction through the removal of sources and the promotion of alternative technologies, when feasible. While it makes sense to seek to replace these sources as opposed to securing them in perpetuity, this revised approach raises numerous questions, including whether some sources will remain vulnerable for longer than under the previous strategy. At the current planned pace, it would take another 17 years to meet the NNSA’s much-reduced target of helping to secure just under 4,400 buildings around the world with dangerous radioactive material—down from a target of roughly twice that just last year. Elsewhere in the NNSA nonproliferation budget, funding for Defense Nuclear Nonproliferation Research and Development activities would fall to $394 million from its $419 million fiscal year 2016 appropriation. This program matures technologies used in tracking foreign nuclear weapons programs, illicit diversion of nuclear materials, and nuclear detonations. The NNSA projected a request of $430 million in fiscal year 2017 research and development funding in its fiscal year 2016 request. The NNSA has defended some of the reductions to the nonproliferation account on the grounds that several major projects have been completed, thereby lessening resource needs, and that the impact of spending cuts can be mitigated by using unspent money left over from prior years, largely due to the suspension in late 2014 of nearly all nuclear security cooperation with Russia. But the cuts proposed for fiscal year 2017, relative to what was projected last year, are significant, especially to the radiological security and research and development programs where the NNSA does not say they will use unspent balances. 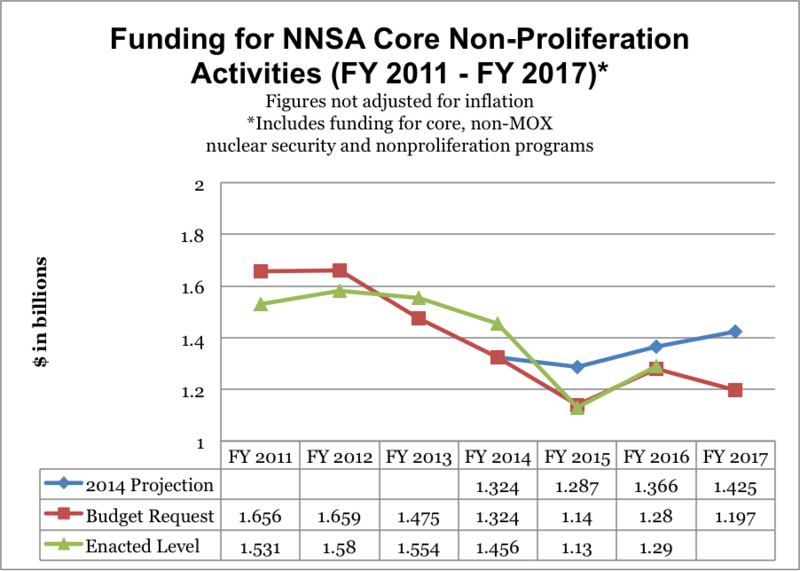 An Energy Department task force report on NNSA nonproliferation programs released last year expressed concern about the recent trend of falling budgets for those programs (see chart). “The need to counter current and likely future challenges to nonproliferation justifies increased, rather than reduced, investment in this area,” the report said. The global effort to prevent nuclear terrorism is at a key inflection point. While the United States can’t tackle the challenge on its own, U.S. leadership and resources are essential. The Obama administration’s fiscal year 2017 budget request was a missed opportunity to advance many good ideas in this space that haven't received adequate attention and investment. Congress has a critical role to play in this endeavor, and there are a number of steps it can take this year to sustain and strengthen U.S. and global nuclear and radiological security efforts. First, Congress should increase fiscal year 2017 funding for NNSA radiological security and nonproliferation research and development efforts, the two programs hardest hit by the agency’s proposed budget cuts. Additional funding would allow an acceleration of efforts to secure dangerous radiological materials and ensure the United States is prepared to confront emerging security and nonproliferation challenges. Congress should also call for a global strategy, stronger regulations, and increased funding to secure and eliminate the most vulnerable highest-risk radiological sources around the world during the first term of the next administration. This multidimensional effort should entail a number of elements, including: securing the most vulnerable sources (where needed); requiring the U.S. Nuclear Regulatory Commission to implement stronger regulatory requirements; supporting universal adherence to the IAEA Code of Conduct on radiological sources; mandating additional cost-sharing by industry; and, where appropriate, accelerating the development and use of alternative technologies. An accelerated international radiological security effort would be consistent with a proposal from Sen. Carper (D-Del.) requiring the administration to craft a plan for securing all high-risk low-level radiological material in the United States. examining ways adversaries could potentially use 3D printing and other new technologies to make nuclear-weapons usable components. strengthening—and sharing—intelligence on nuclear and radiological terrorism threats. In addition, Congress should seek ways to dissuade other states from pursuing programs to reprocess fuel from nuclear power plants, which lead to the separation of plutonium. While the Nuclear Security Summit process has seen significant progress in the minimization of highly enriched uranium (HEU) for civilian purposes, global civilian plutonium stockpiles continue to grow. East Asia in particular is on the verge of a major build up of separated plutonium, which could be used in nuclear weapons and poses significant security risks. Japan and China both have plans to reprocess on a large-scale, and doing so would almost certainly prompt South Korea to follow suit. To its credit, the Obama administration has recently been more vocal in expressing its concerns about these plans. Congress should encourage the administration, and NNSA in particular, to engage in additional cooperative work with countries in East Asia on spent fuel storage options and the elimination of excess plutonium stockpiles without reprocessing. Over the years, U.S. support for nuclear security programs at home and abroad has resulted in an enormously effective return on investment that greatly strengthens U.S. security, and will be even more important in the years ahead in absence of head of state level summit meetings. Indeed, there is a long legacy of members of Congress from both parties working together to reduce nuclear risks. For example, in 1991, Senators Sam Nunn (D-Ga.) and Richard Lugar (R-Ind.) put forward the “Soviet Nuclear Threat Reduction Act of 1991,” which authorized $400 million to create U.S.-led programs assist the countries of the former Soviet Union secure and eliminate nuclear weapons, chemical weapons, and other weapons. This effort became known as the Cooperative Threat Reduction (CTR) Program, which has successfully liquidated thousands of Cold War-era Soviet weapons. Twenty-five years later, the evolution of security and proliferation challenges requires similarly bold and innovative Congressional leadership. Three men were arrested in Moldova earlier this year for attempting to sell radioactive materials to an undercover police officer posing as a middleman for the Islamic State group. Three men were arrested in Moldova earlier this year for attempting to sell radioactive materials to an undercover police officer posing as a middleman for the Islamic State group, according to an Associated Press story published last month. According to the Oct. 6 story, a joint operation involving the Moldovan police and the FBI led to the arrest in February, after the alleged smugglers gave the undercover officer cesium in exchange for money. Certain types of cesium could be used in a so-called dirty bomb, which combines conventional explosives with radioactive sources to spread contamination. According to the AP article, the seller claimed to have enough cesium-137 for a dirty bomb and wanted to sell it to the Islamic State for the purpose of bombing U.S. citizens. Three smugglers were arrested after selling cesium-135 to the Moldovan police officer as a test of his intentions before selling him the cesium-137. Cesium-135 is not potent enough for use in a dirty bomb. The AP reported that a fourth man in the smuggling ring, reportedly in possession of the cesium-137, which is suitable for a dirty bomb, escaped. Moldovan authorities quoted in the AP story said they thought that the radioactive material came from Russia and that the breakdown in U.S.-Russian relations was making it more difficult to track smugglers. Kirby said that cooperation with Russia on stemming illicit trafficking in nuclear materials is “certainly an issue where we believe there can be cooperative efforts.” There have been such efforts, and “we hope that there will continue to be,” he said. The February arrests are among several in recent years involving illicit trafficking of radioactive material through Moldova. Most recently, in December 2014, six people were arrested in the eastern European country for trying to sell radioactive materials and uranium-238. U-238 is the most common isotope of uranium, but unlike U-235, it cannot be used as a nuclear explosive material. The International Atomic Energy Agency tracks theft, loss, and unauthorized use of radioactive materials in its Incident and Trafficking Database, which receives information from about 130 countries. Between 1993 and 2014, the agency confirmed 2,734 illicit incidents involving radioactive materials. The fourth and final nuclear security summit will take place next March 31-April 1 in Washington, D.C., the White House said Aug. 10. The summits are the most visible feature of an accelerated international effort to prevent nuclear terrorism. U.S. President Barack Obama launched the effort as part of his speech in Prague in April 2009. Summits have been held in Washington in 2010, Seoul in 2012, and The Hague last year. At the summits, participating countries have announced steps they would take individually and collectively to increase the security of fissile materials. These steps have included the removal of nuclear materials, enhancement of capabilities to counter nuclear smuggling, creation of centers to improve nuclear security and training, and ratification of international agreements that govern nuclear security. As the United States prepares to host the final summit, Laura Holgate, Obama’s top adviser for nuclear security, was nominated on Aug. 5 as U.S. representative to the Vienna office of the United Nations and the International Atomic Energy Agency (IAEA). For the last six years, Holgate has served in the position of special assistant to the president and senior director for weapons of mass destruction terrorism and threat reduction on the National Security Council staff, where she has played a central role on the U.S. negotiating team for the summits. The White House has not named a successor for Holgate. In an Aug. 5 statement, national security adviser Susan Rice praised Holgate as “the life blood” of the summit process. The Global Initiative to Combat Nuclear Terrorism (GICNT) laid out its priorities for the next two years in a statement at a June plenary meeting in Finland, announcing that they will include practical activities and regional initiatives to increase capacity to combat nuclear terrorism. The priorities build on GICNT activities since the 2013 plenary in Mexico City and will be expanded to increase regional cooperative exercises and could incorporate nuclear industry participation for the first time. A voluntary, multilateral organization launched in 2006 to strengthen global abilities to prevent and respond to acts of nuclear terrorism, the GICNT has 86 participating states and five official observers. Participation is open to any country that endorses the organization’s statement of principles, which includes voluntary commitments to strengthen nuclear security within each country, improve response capabilities in the event of a nuclear incident, and promote information sharing to suppress acts of nuclear terrorism. Thomas Countryman, U.S. assistant secretary of state for international security and nonproliferation, said on June 16 at the opening of the plenary that the “structure and flexibility provide unique value in advancing global nuclear security objectives” and that all participating countries have improved their capacity to “prevent, detect, deter, and respond to nuclear terrorism” since 2006. Russia and the United States, co-chairs of the initiative, issued a June 17 statement summarizing the plenary meeting. The statement said partner countries will continue to focus on holding practical exercises and activities at the regional level to increase coordination, facilitating the exchange of best practices, and exploring “cross-disciplinary themes” from the three GICNT working groups. One working group, chaired by Finland, covers nuclear detection. Another, chaired by Australia, deals with nuclear forensics. The third one, chaired by Morocco, focuses on responding to and mitigating the effects of an act of nuclear terrorism. The co-chairs’ statement also noted the accomplishments of the working groups over the past two years. The most recent activity, held in May in Germany, included an exercise, named Radiant City, that built on a January exercise in Finland, called Northern Lights, and focused on tracking down missing radiological material and using nuclear forensics to investigate illicit trafficking of nuclear materials within a state’s borders. The nuclear forensics and nuclear detection working groups collaborated on the exercise. The GICNT also has an implementation and assessment group charged with coordinating the organization’s activities and ensuring that they complement other international efforts to combat nuclear terrorism. The Netherlands took over from South Korea as chair of that body at the June 16-17 plenary. The co-chairs’ statement noted that the Netherlands expressed interest in promoting the participation of nuclear industry representatives in future GICNT activities. The next plenary meeting is scheduled for 2017. Working groups are to meet periodically over the next two years. A U.S. official said on Aug. 18 that the next exercise, which the response and mitigation working group will lead, is scheduled for November. The exercise, named Blue Raven, will be held in London and will focus on the role of national crisis management centers in responding to nuclear events, the official said. Mexican authorities recovered all of the radioactive material stolen from a truck in Mexico in early December, according to Mexico’s National Commission on Nuclear Safety and Safeguards. The truck carrying cobalt-60, which is often used for cancer treatment, was stolen Dec. 2 in Tepojaco on its way from a hospital in Tijuana to a radioactive waste storage center, according to a Dec. 4 press release from the International Atomic Energy Agency (IAEA). The Mexican nuclear commission informed the IAEA that the truck was found two days later near the town of Hueypoxtla, about 23 kilometers from where it was stolen. The radioactive material was in a nearby field. The material, which had been removed from its protective casing, was fully recovered by Mexican authorities on Dec. 10 using a robot, according to a Dec. 12 IAEA press release. The IAEA classifies cobalt-60 as a Category 1 substance, indicating a high risk to human health if it is not managed and secured properly. According to the agency, exposure to an unshielded Category 1 source for a few minutes could be fatal. The IAEA uses a five-level scale to categorize radioactive substances, with Category 1 being the most dangerous. There have been 615 incidents of theft or loss of radioactive material from 1993 to 2012, according to a 2013 IAEA summary. The agency said theft or loss of Category 1 materials is “rare,” with none reported in 2012. Russia and the United States have replaced the 20-year-old Nunn-Lugar program to provide U.S. assistance to secure and dismantle Russia’s excess weapons of mass destruction with a more limited agreement. Russia and the United States on June 14 agreed to a pared-down replacement for a 1992 pact that formed the basis of their joint efforts to control or destroy Russian weapons of mass destruction and related material and delivery vehicles. The Obama administration described the new pact as a recalibrated extension of the old agreement. But some current and former congressional staffers said they saw it more as the sunset of the Cooperative Threat Reduction (CTR) program, commonly known by the names of the authors of the 1991 legislation that established the effort, Sens. Richard Lugar (R-Ind.) and Sam Nunn (D-Ga.). The new accord replaces the so-called CTR umbrella agreement, which expired June 17. Cooperation between the two countries will continue “in a broad array of nuclear security and nonproliferation areas,” such as security of nuclear and radiological material and conversion of research reactors from using highly enriched to low-enriched uranium fuel, according to a June 19 State Department summary of the agreement. But Russia “will assume the costs [of] and complete without further U.S. assistance” two main parts of the CTR effort—destruction of ballistic missiles and chemical weapons—the summary said. That shift is reflected in the roster of “executive agents” listed in the agreement. For Russia, the list includes the State Corporation for Atomic Energy, commonly known as Rosatom, which is the principal Russian agency for the work on nuclear materials security and nonproliferation, but does not include the Ministry of Defense, which was responsible for the work on ballistic missiles, or the Ministry of Industry and Trade, which was the main Russian agency for CTR work on chemical weapons destruction. The new agreement “reflects the evolution” of the U.S.-Russian partnership, the summary said. In a June 25 interview, a State Department official said that the effort has developed into “more of an equal partnership” than it was at its inception. Russia is “more comfortable” with that form of the relationship, and so is the United States, the official said. Russian media reported last year that Moscow may not want to continue the CTR agreement at all because it no longer needs Washington’s financial assistance to carry out the program and does not want to risk revealing sensitive information to the United States. According to Western experts, Moscow had resented being dependent on Washington to pay for securing its own weapons. In a June 17 statement, Nunn, who is now co-chairman and CEO of the Nuclear Threat Initiative, acknowledged that “key elements of what we have known as Nunn-Lugar will not be carried forward under this umbrella agreement” and said that “[w]e must find ways beyond this agreement to work together” on issues relating to weapons of mass destruction. Thomas Moore, a former Lugar staffer who is a senior fellow at the Center for Strategic and International Studies, said in a June 21 interview that the joint effort “was going to end sometime, and now it has.” The new agreement “marks the final chapter in the end of the Cold War,” he said. “Russia no doubt decided that the meager funds weren’t worth the foreign intrusion at their most sensitive military sites,” said Walker, who is a member of the Arms Control Association Board of Directors. The Russian embassy in Washington did not respond by press time to a request for comment. In addition to the programmatic changes, a key difference between the new agreement and its predecessor is in its liability provisions. Under the original agreement, the U.S. government and its contractors were shielded from virtually all liability for accidents that could occur under the program’s work in Russia. In 2006, when the agreement was being renewed for the second time, the deal reportedly was on the verge of collapse due to Moscow’s concerns over liability. Under the new agreement, Russia is to notify the United States when it believes it has grounds for a liability claim against the United States or its employees or contractors. The two sides “shall…attempt to achieve a mutual understanding within 90 days” of the notification. If they do not reach this understanding, Russia can begin legal proceedings. The liability arrangements are described in a protocol to the 2003 Framework Agreement on a Multilateral Nuclear Environmental Programme in the Russian Federation (MNEPR), which replaces the CTR umbrella agreement as the underlying legal basis for the threat reduction work. The MNEPR has traditionally outlined the legal underpinnings for countries to assist Russia with spent nuclear fuel safety and radioactive waste management. Elizabeth Sherwood-Randall, the top National Security Council (NSC) adviser on European affairs, has been named to a new NSC position as coordinator for defense policy, weapons of mass destruction (WMD), and arms control, the White House announced March 19. Sherwood-Randall takes over the WMD and arms control portfolio previously held by Gary Samore, who now is executive director of the Belfer Center for Science and International Affairs at Harvard University. The newly created NSC position adds defense policy to the old portfolio in an effort to improve coordination on related issues, according to White House officials cited in a March 19 report in The Cable. President Barack Obama “will look to [Sherwood-Randall] to bring significant energy and capability to his second term as we pursue the ambitious goals he set forth in his Prague speech in 2009,” national security adviser Tom Donilon said in the announcement. In that speech, Obama laid out a broad nuclear policy covering arms reductions, nonproliferation, nuclear security, and other issues. Sherwood-Randall will work with Lt. Col. Ron Clark, acting senior director for defense policy and strategy; Laura Holgate, senior director for WMD terrorism and threat reduction; and Lynn Rusten, senior director for arms control and nonproliferation, The Cable said. During the Clinton administration, Sherwood-Randall served as deputy assistant secretary of defense for Russia, Ukraine, and Eurasia, where she played a role in the denuclearization of Belarus, Kazakhstan, and Ukraine after those countries inherited nuclear weapons with the dissolution of the Soviet Union. She previously served as chief foreign affairs and defense policy adviser to Vice President Joe Biden when he was a U.S. senator. Sherwood-Randall will take up her new post April 8, the White House said. Legislation that aims to help prevent nuclear terrorism and improve nuclear security is stalled in the Senate after the introduction of an amendment proposed by Judiciary Committee ranking member Charles Grassley (R-Iowa). Grassley’s amendment would allow the death penalty for an act of nuclear terrorism that resulted in death and would give wiretapping authority to federal officials in the case of nuclear incidents. Similar provisions appeared in earlier versions of the legislation drafted by the Obama administration, but were not contained in the bill passed by the House of Representatives in June. (See ACT, July/August 2012.) House Judiciary Committee members had negotiated with the administration to remove the measures prior to introducing their own draft of the bill. The bill would bring the United States into compliance with the International Convention for the Suppression of Acts of Nuclear Terrorism and the 2005 amendment to the Convention on the Physical Protection of Nuclear Material. The 2005 amendment extends protection requirements beyond the original agreement, which covers nuclear material while in international transport, by expanding the coverage to apply to nuclear facilities and to materials in peaceful domestic use and storage. It also would impose new legal penalties for misuse of radioactive material and sabotage of nuclear facilities. The anti-terrorism agreement provides a definition of nuclear terrorism and specifies how states should handle offenders and illicit materials when seized. In his e-mail, Grassley said that “[t]he bill and my amendment cleared the Republican side of the Senate before the Senate went into recess, and are now stalled on the Democratic side.” Both senators emphasized the need for Congress to pass the bill. If the legislation is not approved before the end of the current Congress, it will need to be reintroduced. The bill also includes implementing legislation for two treaties dealing with maritime security. Pakistan’s security is adequate to deal with the recent attacks on its military installations, including a Sept. 5 threat to the Dera Ghazi Khan nuclear complex, according to former Pakistani and U.S. officials. According to The Express Tribune, a Pakistani newspaper, the threat to the Dera Ghazi Khan complex was discovered when Pakistani intelligence services intercepted a Sept. 5 phone call between two suspected members of the Pakistani branch of the Taliban, known as the Tehreek-e-Taliban. Pakistani newspapers quoted a military officer as characterizing the plans for this attack as the “first-ever serious security threat” to the Dera Ghazi Khan military facilities. Pakistani newspapers reported that suicide bombers were planning to gain access to the complex using three or four vehicles. The government responded by deploying forces from the Pakistani army and the local Punjab police. No actual attack on the facility was reported. If such an attack had occurred, it would have caused “more of an embarrassment than any real damage,” given the nature of the nuclear facilities and the remote location of the complex, Salik said. Clary said that concerns over the security of Pakistan’s nuclear arsenal, however, are “understandable and appropriate” because it is difficult for nuclear weapons security in any state to “function perfectly all the time.” Such concerns are even more acute in the case of Pakistan, where the militant and terrorist threat makes the situation “more dangerous” than in any of the other countries that possess nuclear weapons, he said. At an Aug. 14 press briefing, U.S. Secretary of Defense Leon Panetta said that if terrorism is not controlled in Pakistan, the country’s nuclear weapons could be at risk. Clary expressed greater concern over Pakistan’s decision to pursue battlefield nuclear weapons and the country’s “rapid production” of fissile material. He said that the battlefield weapons are the “most worrisome” and if deployed during a conflict would increase risks in several ways.